The opening opens on at 0.13 seconds, he starts moving to the correct corner at 0,15 seconds. You can't analyze anything in 0.02 seconds. - I don't have an Android-phone, so I just looked at the screenshots. Thanks for including my suggestion. Cool! One small suggestion, though: The flags look more like opened squares than closed ones although they are closed. Some might find this confusing. I'll see whether I can stop by, I have a dancing tournament on Saturday Sept. 26th. 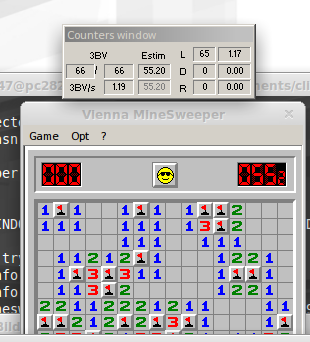 It's the biggest size Windows Minesweeper allows in Custom Mode. Obligatory Update 326 int NF IOE 1.00 so far. Lol, the first 8 seconds look a bit like NF IOE 1.00 playing. BTW, Ive got 165 int NF IOE 1.00 games so far, one of them with 12 (!!) openings. Flags is kinda fun (though strange for an NF-player like me). The green flags are helpful, but the flag-shape does not help much. That flag is there because OP uses a strange version of MS that gives you "starting clues" and obviously that flags was part of those clues. Has anyone of you ever tried to do that little trick more than once or twice (or 30 times)? 'Cause I've currently go 32 NF Int IOE 1.00 games. And btw. one of them has 10 openings, another one only 2. I am pretty sure I am the only one to count such crazy things. I did one too, it's probably mainly a NF-problem although I placed flags in the picture. As some of you know I am translating the Minesweeper Wiki. I created this to ask for help when I need it. The link at the end of the UPK article does not work, is the content of the link somewhere else available? Got an 1.00 37/37. Just a f****** good feeling. Pretty slow video, I know.